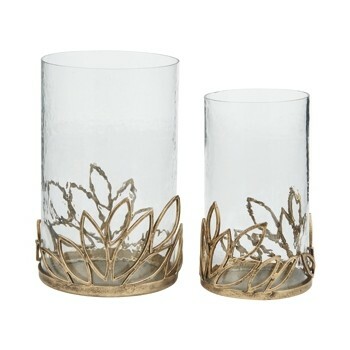 Illuminate your space in contemporary style with this 2-piece candle holder set. Antiqued goldtone finish brings a down-to-earth feel to the leaf-inspired metal base design. Glass is tinted and textured, giving you an aesthetic you can love.